I have been asked what are miniatures a lot here recently since I have been posing my work I have been doing on Facebook and around the internet. I am no pro when is comes to painting these things. Maybe you don’t even own any miniatures maybe you do. Maybe you know what they are but are too afraid to start or not sure where to start. so they just sit there collecting dust in a box somewhere. First of all, they’ve come a long way from the old pewter days on unpainted sculpts used almost exclusively for Dungeons and Dragons. Modern manufacturing methods are creating some fantastically detailed sculpts from an ridiculous array of genres, and from a variety of new plastics and resins. There’s a tiny little world out there. It even makes me want to get a 3D printer and create my own. Part of my impetus for giving this a shot was that I needed something to get me away from my computer screen that was also very relaxing and fun. It was very intimidating at first because noting i seemed to do was turning out good, but through a little research plus trial and error I have started to get better at it. Again, I am a complete novice at this, so I was hesitant to invest much money into it, but I’m really glad that I did. But I have spent most of my time trying to find a brush that I like I have a pile of brushes now, but only a few do I really like. the two brushes I have enjoyed using thus far are a 10/0 loew-cornell 7300 shader and a 12/0 Master’s Touch Mini Kolinsablon Round Brush. 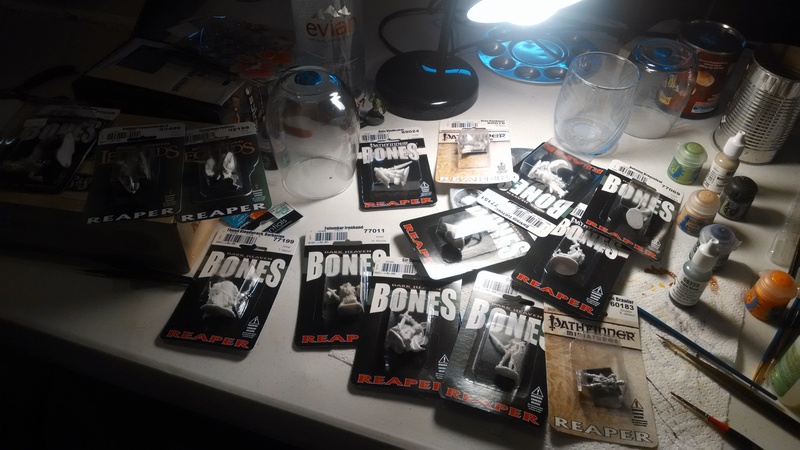 I use primarily Reaper Paints and Vallejo paints that I get from hobby lobby. I prefer Reaper’s. there are other I have use like Citadel paints but I do not like them at all. Some people will swear by them. I have not used them but i am told that you can also use the cheaper tubes of acrylic paints just fine so long as you thin them up first. Painting miniatures is relaxing and enjoyable. In a way, it’s a nerd’s version of meditation. I turned on my desk lamp, played some music quietly in the background, and had a really peaceful time painting my figures. I made the mistake of looking online at miniatures painted by pros. (Never compare your beginning with someone else’s middle.) Mine aren’t even in the same league, but I’m pretty pleased with my first effort and I’ve had a GLORIOUS time doing it.